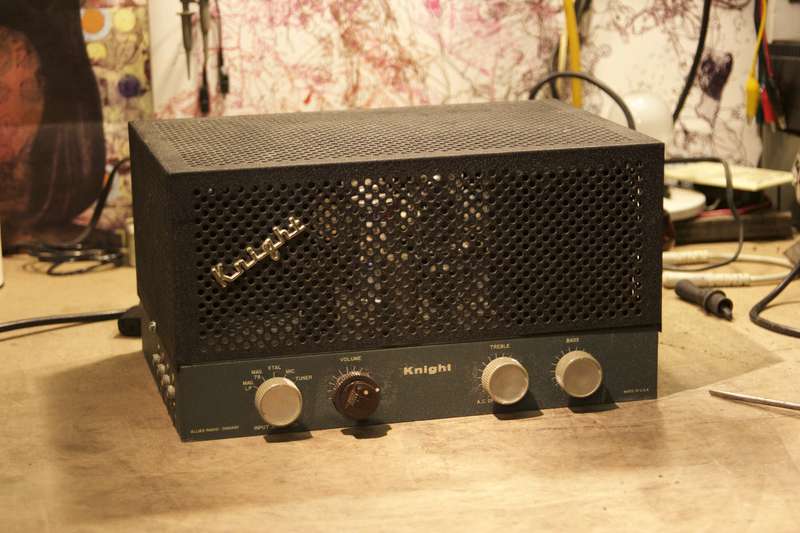 Knight mono amplifier. NOT a stereo, because it is mono. Model unknown. Made by Allied Radio Corp. in Chicago sometime in the early 60s I’d guess. Cathode bypass cap for output section looks to have a 1960 date code. Has two 6L6GCs in push-pull in the output section for 27W at clipping, pretty damn loud. Nas sounded awesome through it into a 2×12, blasting. On/off switch is incorporated into the treble knob. This way you can never turn your amp on with too much treble, which is annoying. Gotta love those vintage tube radios from back in the day. Transformers are huge. Makes it easy to just flip it over and work on without any fear of crushing tubes. Amazingly this thing still works other than just needing a good cleaning of the pots and jacks, and tube sockets. Bias was set at about 85% with the stock 200R cathode resistor so I increased it to 250R which brought the bias down into a reasonable level, around 64% plate dissipation. 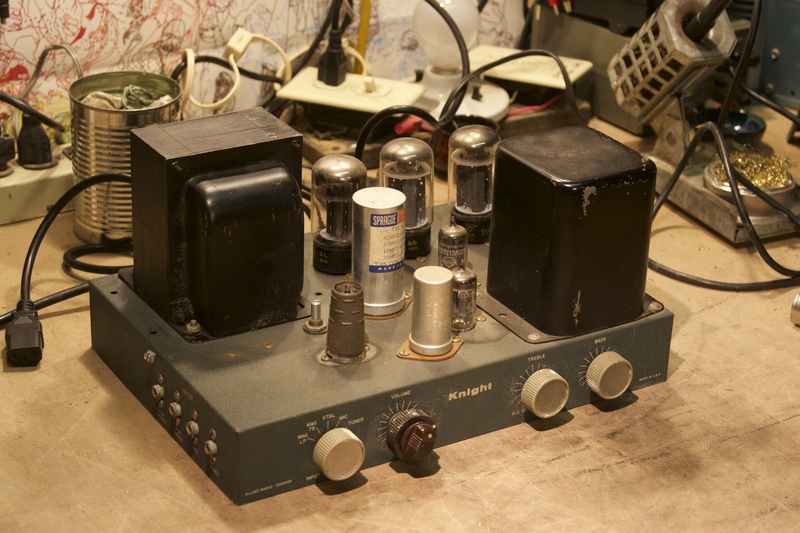 If this were mine I would recap and let it run for another 50 years, but this one will remain mostly untouched, as the owner just wants a check through and confirmation that it works good so it can be sold. 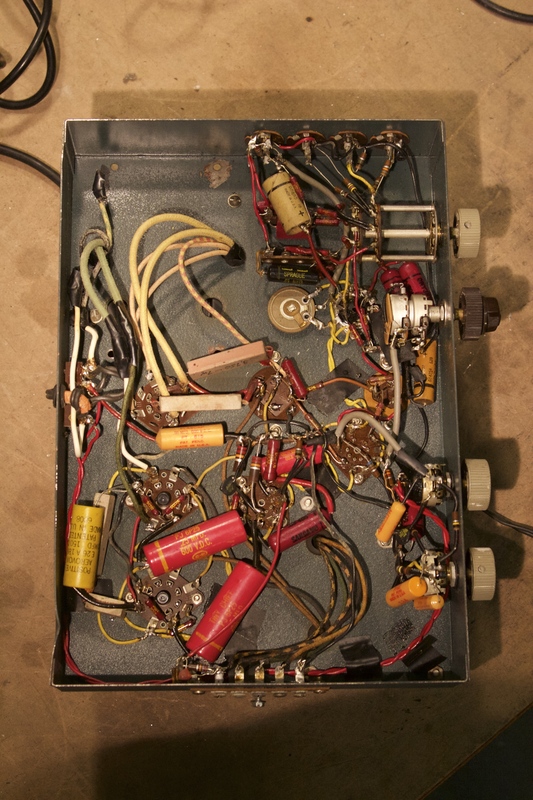 Old school point to point wiring on this piece.